I never liked cakes with heavy decoration from the bakery. But for my own birthday last week I made a cake with icing on top. This is the first time I used an icing reciepe and it turned out awfully sweet. My boys tried just one bite and they gave up! Christmas has not been a convention in our culture. But people love to celebrate the day as a holiday. I, too, love the Christmas spirit and atmosphere. I still remember the family that invited me to their home for Christmas Eve and the big feast they offered while I was studying in Kansas. The warm hospitality has always been the mark of my American experience. The Christmas dinner is pretty much a warming-up event for our Chinese New Year which is less than 4 weeks away. My mother-in-law and sister-in-law's family were invited. They enjoyed the meal a lot. I call the dinner " The east meets the west". Except roasted chiken, focaccia, and paella, I also prepared our traditional hot pot to warm up everyone. Temperature in the Christmas Eve was close to 10 degrees C.
The roasted chicken was a total success. It's the highlight of the dinner that night. Crispy outside and juicy inside. Yammy!! We have 2 Costco conveniently located in different sites of the city I live in. We also have many of the others but Costco is always my best choice for grossary. 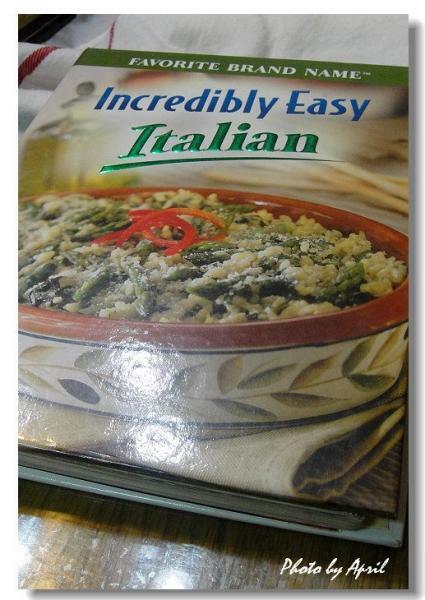 I bought this cooking book at Costco 4 years ago and have been practicing the recipes it offers. And as it says I found it incredibly easy to follow. Rustic Tuscany Bread from the cooking book has been the most facinating piece to me. I did it quite often and I did it kind of my own special version. It looks gorgeous and tastes fantastic. My friends screamed every time I brought it to dinner parties. Drained tomato stew as filling. I rolled the dough to a 5mm thick 30x40 cm rectangle and spray 1 table spoon of olive oil with a sprinkle of sea salt evenly over the dough. Drained tomato stew over 2/3 of dough. Add a layer of pizza cheese. I guess it will be pretty much OK if you add more ingredients. First 1/3 on the second 1/3~~~~My poor English. ><! 2/3 on the last 1/3~~~~folding done! Let it rest for one hour to double the size. Score few diamonds on the top of dough. This is the most exciting part of making the bread. The tip is to cut the dough deep and wide to reveal the filling but still firm enough to hold the filling inside the dough after baking. The beauty from my oven. I love how the scoring turned out. Oriental bread as I refereed to is based upon the texture of dough. Most of the oriental breads we make here use sweet dough for more delicate and tender texture. Formula of sweet dought that we are using can be different one way or the other from those you are familiar with. Spring onion cheese roll is one of the most popular breads from my oven. I made it last night for my boys breakfast this morning. Actually, it's been a party attraction that can be prepared very easily and can drow a lot of appreciation especially from kids. Ingredients prepared for the bread. I also add some chopped bacon for better flavor. In our community we always say that Chinese bun is steamed bread and bread is baked Chinese bun. The idea of the spring onion cheese roll came from one of our tranditonal steam buns. I just add up bacon and cheese and sent it to my oven and make it oriental bread as what I call it. Waiting for final proofing after shaping and dividing. Final proofing done~~~I always love how the bread appears after proofing. It looks gorgeous. Taking baking as cooking is the game I love playing. Comment: I choose not to show the method here since it's simple enough to follow just by checking on the ingredients. Although my English is not not good enough to express what I have to say in 100%, I'm sure in the baking republic all the ingredients speak the same language.